This is a design concept being floated to the Bioware development team for SWTOR (though would work in pretty much any MMO, I think.) We have clear and obvious reason to believe that it may be the most awesome boss fight idea ever conceived. One of our guild members, Sferics, came up with the core of this idea earlier this evening and we decided this needed to be written up and submitted to the highest of development authorities for immediate implementation in future content! I give you the “Weeping Angel” boss fight mechanic! The scenario can vary but in a SWTOR context, Flash Point or Operation, something like the force ghost of an ancient Sith Lord trapped in a vault lined with statues would set the stage well. The boss can be at the head of the room represented by a large statue. The key to the mechanic would be the series of human sized status around the perimeter of the room initially positioned with their hands covering their eyes! Darkness – The entire fight would need to take place in near dark for the mechanic to make sense with what you’d expect from “Weeping Angel” behavior. We’ve already seen this in other flash points in SWTOR and works well. Flashlights – At the entrance, each ops team member would be able to pick up a light of some kind. These would light only for a short period on activation, say 10 seconds, with something like a 30 second cool down. This would force the need for coordination between team members for the lighting mechanic to have full coverage. Again, these already exist in some form in SWTOR content. 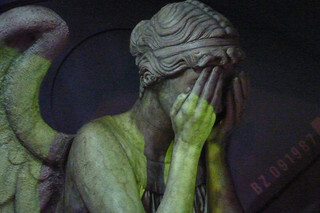 Weeping Angels – The key mechanic and I imagine you can already guess how these work. The statues surrounding the room are fixed and immune to damage while “observed.” The light from the flashlights when swept over them would serve to quantum-lock the angels for a period of a few seconds. Once this timer is up, if they have not been re-locked with a flashlight they move toward the nearest player. Feeding – If a player is reached by an angel that player is removed from the fight and “lost in time.” At this point, the angel is no longer immune to damage and must be DPSed down to return the missing player to the fight. Quantum-Lock – With only 10 seconds of light and a 30 second cooldown it would take at least 4 players rotating turns running a circuit of the room to keep light on the statues. This would be the key coordination mechanic and would need to be tightly timed enough to make angel movement likely. Boss Mechanics – To increase pressure on the group and the likelihood that angels will be moving, various boss mechanics can be introduced as well. As only one possible example, high damage energy beams that divide the room for a few seconds might prevent the current flashlight runner from reaching some angels. This would either need to be compensated for by players spread on the opposite side or cause the need for the team to be in motion, kiting the moving angels. As mentioned, this is obviously one of the most awesome fight concepts ever proposed and as such should be implemented immediately. I also think naming the boss after Sferics would be nice, and maybe throw in a little lore object that credits the Lords of Light (LOL) operations team of Alea Iacta Est as well. * Thanks to machernucha via Flickr for the creative commons photo.